कृपया हिंदी अनुवाद के लिए नीचे देखें! According to the revealed scriptures, the Supreme Personality of Godhead, Lord Sri Krishna, is eternal and His pure devotees are also eternal. But the question arises that how can the pure devotees who are in a material body be eternal? Since we all know that this material body is temporary. If we try to find the answer to this question then we arrive at the following conclusion – pure devotees live their lives according to the instructions of the Supreme Lord. So the instruction can also be to accept a material human body which is temporary. Hence to fulfill the desires of the Lord, pure devotees who are eternal by nature accept a material body which is not eternal. Therefore, we individuals who are desirous of making this extremely rare human birth brim with loving devotion must renounce our own desires which are inimical to the scriptures and born of the speculative mind; rather, we must live our lives following the instructions of our pure devotee initiating spiritual master (diksa guru) and the instructions of our instructing spiritual masters (siksa gurus). 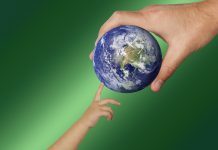 The more the people of this world, indulging in their own independence, give up the path of following in the footsteps of the pure devotees, the greater the chaos that will manifest in society. The Lord bestows His causeless mercy upon those who are non-duplicitous and completely surrendered unto Him. Those who are the recipient of the Lord’s mercy will never have the fear of losing anything related to this material world. In the realm of pure devotion, the intense desire for material gain, name, fame, distinction and desire are counted amongst the deadliest things of the material world. To the extent to which we develop attachment to material gain, name, fame, distinction and desire, to precisely that extent, we will become confused and doubtful. Eventually we will become totally separated from the Lord and from the association of His pure devotees. The more we get separated from these manifestations of pure devotion, namely the devotees and the spiritual master, the greater we will undergo pain and suffering from the fears of this material world. The main goal of taking birth in a human body in this material world is to render devotional service imbued with pure love to the Supreme Lord Krishna while being free from material greed and lust. It is precisely this service attitude that is the eternal constitutional position of each and every living entity. The perfection of this human form of life is achieved if one can render such devotional service following in the footsteps of the Lord’s pure devotees. 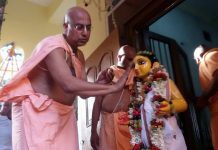 Gopinath Gaudiya Math’s founder ācārya, he who has entered the Lord’s eternal pastimes (nitya-līlā-praviṣṭa), 108 Sri Srimad Bhakti Pramode Puri Goswami Thakur is one such pure devotee of the Lord amongst the pure devotees of all Vaishnava disciplic successions. 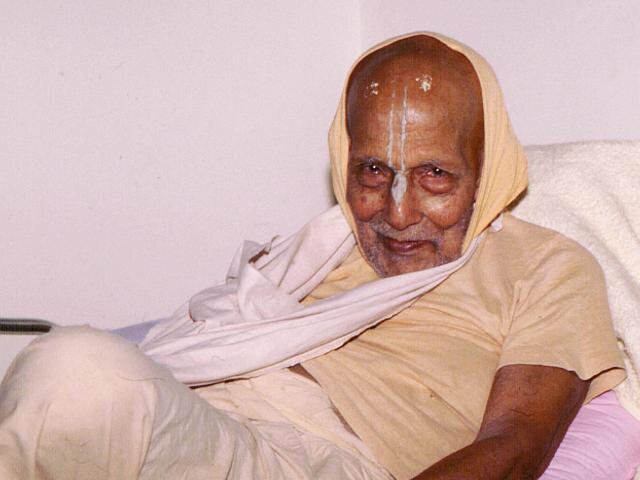 Throughout his life, Sri Srimad Bhakti Pramode Puri Goswami Thakur taught us by his personal example to be a living embodiment of the third verse of Sriman Sacinandana Mahaprabhu’s Śikṣāṣṭakam. He lived his entire life according to this verse and taught through his own example. 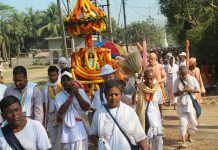 Even in this iron age of quarrel, hypocrisy, and crookedness, by the mercy of guru-vaishnava-bhagavan, by becoming humble and tolerant, by giving up material gains, worship and position, by offering appropriate respect to everyone and by chanting the Holy Name in a peaceful state of mind, one can become qualified to achieve pure love of God – Krishna-prema, which is extremely rare even for the residents of heaven (svarga). We are publishing this edition of Bhagavata Dharma e-magazine on the auspicious occasion of my Gurudeva’s disappearance day festival. On the disappearance day, devotees normally reflect upon and realize the separation felt from the physical presence of the spiritual master. We can gauge our spiritual progress by measuring the extent to which we feel this separation. Therefore, we cannot ignore the importance of separation. Amongst the whole community of devotees, the realization of separation experienced by three individuals described by Srila Krishnadas Kaviraja Goswami in the Caitanya Caritamrta is by no means equal to or even comparable to the separation we feel from other Vaishnava ācāryas. Rather, Gaudiya Vaishnava devotees are eternally longing to taste the separation felt by these three individuals described by Srila Krishnadas Kaviraja Goswamipada. ayi – Oh! ; dīna-dayārdra-nātha! – master who is compassionate upon the fallen! ; he – Oh! ; mathurānātha-master of Mathura; kadāvalokyase– when will I be able to see you;hṛdayam-heart; tvad-aloka-kātaram-pain from not seeing you; dayita – Oh my dear; bhrāmyati– becomes overwhelmed; kim – what; karomy aham– do I do? “This verse (ayidīna-dayārdra-nātha…) was spoken by Srimati Radha Thakurani. By Her mercy, this verse was manifested through the words of Madhavendra Puri. Sri Gaurachandra tasted this verse. There is no fourth person who can taste this verse. By studying the above two verses, we can understand that firstly, Srimati Radharani uttered the topmost expression of separation, ayi dīna-dayārdra-nātha, with the objective of getting the Supreme Personality of Godhead Sri Krishna to return to Vrindavan. After tasted by Srimati Radharani, this topmost expression of separation was tasted by the ācārya of divine love, Madhavendra Puripada. Both Advaita ācārya and Nityananda Prabhu had the utmost respect, reverence and affection for Madavendra Puripada. After tasted by Madhavendra Puri, this topmost feeling of separation was then tasted by Sri Sacinandana Gaurahari who is Sri Krishna Himself, beautifully ornamented with Radharani’s mood and complexion. He is the form of extreme magnanimity, coming to deliver everyone in this iron age of Kali and He is the life of the residents of Nadia. Srila Krishnadas Kaviraja Goswami concludes the verse by saying that other than these three divine personalities, there is not a fourth person to this day in the entire world of devotees who can taste this mood of separation. In order for us to taste a drop of vipralambha, it is thus clear that we must pray for i) the acceptance of genuinely following the path shown to us by the spiritual master and, ii) the mercy of the Lord. The mercy of the Lord is showered upon us solely through the pure devotees of the Lord. Therefore, it is best for those desirous of spiritual advancement surrender themselves completely from the very core of their hearts in the service of the spiritual master and devotees (guru-vaishnava). In this way, the might get the fortune to taste such vipralambha rasa and their extremely rare human lives will be filled with transcendental bliss.